Welcome to Etz B'ney Yosef! We believe that in these End Times, God is fulfilling this prophecy. Similar prophecies appear many times in both the Tanach and the Brit Hadashah. “For when Elohim made a promise to Abraham, because He could swear by no one greater, He swore by Himself, saying, ‘Surely blessing I will bless you, and multiplying I will multiply you’" (Hebrews 6:13-14). The Elohim of Abraham made a covenant promise to our forefather. It is backed by a very judicial signature, His own Name. The first part of this covenant promise is found in Genesis 12:2-3: “I will make you a great nation; I will bless you and make your name great; and you shall be a blessing. I will bless those who bless you, and I will curse him who curses you; and in you all the families of the earth shall be blessed." When Abram was 99, Almighty Elohim identified Himself again, “I am” and said: “I will multiply you exceedingly” (Genesis 17:2). One life, in one sperm, in one dead womb, of one mother - Sarah - to whom the same Elohim promised: "And I will bless her and also give you a son by her; then I will bless her, and she shall be a mother of nations; kings of peoples shall be from her" (Genesis 17:16). Anyone who believes in this Elohim of Abraham and Sarah, must in this generation bear witness to the reality of His word and His faithfulness to keep covenant. Replacement theology has made a mockery of Elohim and His Word (Yeshua). The Almighty Elohim has accomplished what He said He would do. 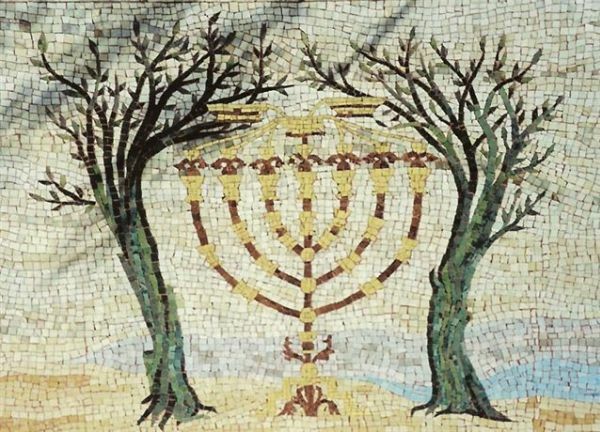 The seed/life that was birthed was never meant to be marked by religion, of one kind or another (Judaism, Christianity, or some hybrid of those two). YHVH promised a “nation,” a people living under the government of Elohim. If there is to be a so called religion, it can only be a personal relationship with the Elohim of the fathers, a relationship that issues from a circumcised heart that is obedient to the Word of Elohim. YHVH’s covenant with Abram was sealed by a sacrifice of animals that were divided into two halves. This was the first evidence of what would happen to the one nation that was promised. Jacob, who epitomized the chosen nation, divided his household into two camps, two peoples, and two nations. This was done because judicially YHVH requires two witnesses who are to bear witness to the One who walked between the sacrifices and swore by His own name - the “I am.” In the past 150 years YHVH has moved and maneuvered nations in order to bring the first stick (Judah) back to the land and establish them again as a nation among the nations. He is now doing the same thing to the lost tribes of Israel. He is saving them, gathering them into families, and the families into communities, and to these communities He is granting or restoring their specific national identity as the Nation/stick of Joseph in the hand of Ephraim. We cannot take lightly these covenant statements that the Almighty Elohim made with our forefather Abraham and wife Sarah. YHVH will have two nations living side by side in the land that is promised to each of them, and ultimately they will be joined together as one Holy Nation with King Messiah son of David ruling over them to be a blessings to the rest of the nations, fulfilling what He promised: “and in you all the families of the earth shall be blessed" (Genesis 12:3). If you are one of those from the lost sheep of the House of Israel who knows Yeshua as your redeemer and have the above understanding, then we invite you to participate in the B’ney (sons of) Yosef National Congress which is to take place in Ariel, on the mountains of Ephaim, in May 25 to 27th, 2015. For more information on the Congress, go to our Projects page. As the time nears for the Third Ephraimite Congress (23 - 30 March 2018), there are updates and additional plans for the event. Check out the latest information here. In preparation for the Third Ephraimite Congress, a look at these Excerpts from speeches given at the First Zionist Congress and from its Jubilee Celebration may be helpful in preparing your heart for the event. My horn is exalted in יהוה. the grave and brings up. Volunteer in Israel has a very detailed site. Pay close attention to the visa instructions. Both Volunteers for Israel and Sar-El have volunteer programs in support of the Israeli military. Hayovel is a Christian organization that brings Christians, mainly to Samaria, to help Israeli farmers. Destination Israel has a variety of volunteering, study and internship programs for young people. Beit Bracha is a Christian guesthouse in the Galilee (Migdal). In return for cleaning, making beds and kitchen work, volunteers get room and board. The volunteer team is headed up by a wonderful couple, Kent and Shauna Splawn. The preferred minimum time of service is one month, but it is possible to get volunteer visas for up to two years. Email bbracha@netvision.net.il for more information. Go Eco, a secular organization, was created by experienced volunteers for people who are eager to travel and contribute to the community, wildlife, and environment they visit. They offer a wide range of volunteer opportunities, including several in Israel. In particular, the Ecological Village at Tzukim, located in the Arava near Eilat, is highly recommended by both workers and volunteers. It is a holiday village and the volunteer work consists of construction of the mud cabins, and other chores relating to the compound, as well as to guest cabins (such as cleaning). Volunteers work 6 hours a day 5 days a week, and receive room and board. Yan (Israeli) and Zoe (Canadian), both Israelite believers, work for this organization in Israel. For more information, contact Zoe by email at zoe@goeco.org or by telephone at US: +1 646 240 4545, UK: +44 203 318 4004, or AU: +61 2 8014 9393. Zoe's extension number is 502. Aleh Negev Nahalat Eran is a state of the art home for the most vulnerable members of society - the severely disabled - situated in the Negev. There is preference for long term volunteers. The minimum is one month. Visit their website at aleh.org and watch this amazing YouTube video to learn more about this unique ministry. You may email the volunteer coordinator at erez@israel.org. If he doesn't answer your email, call him at 972-73-2360000. Various University study opportunities are availablr in Israel. Disclaimer: None of the listed bodies that offer volunteering and/or studying opportunities posted here are necessarily endorsed or recommended by us. The purpose of this list is solely to provide information.